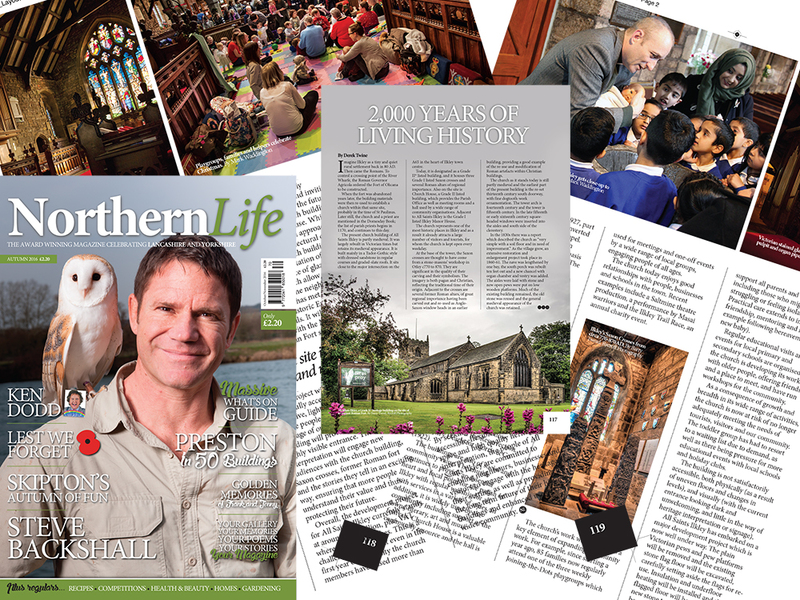 We’re celebrating that the story of All Saints Ilkley, past , present and future has been included within this Autumn’s edition of Northern Life magazine. The three page article written by Derek Twine explores how our church came into being and the adaptions and changes over the centuries. Whilst Derek devotes words and space to our historic heritage this is a story about our community with the church as an essential heart and focal point for the town and parish of Ilkley. Northern Life is an award winning magazine celebrating Lancashire and Yorkshire, and this edition is packed with other excellent articles. The Autumn 2016 copy is now on sale from both the Parish Office and Church (on a Sunday morning) the cost is £2.20, with 50% of the cost price (£1.10) of each magazine sold at All Saints Ilkley being donated by the Editor – Karen Shaw (Frank and Jenny Shaw’s daughter) to the CD Fund. Thank you so much Karen for your generosity. This article was posted in Church Development, Mission. Bookmark the permalink. Follow comments with the RSS feed for this post. Both comments and trackbacks are closed.